Foo Fighters - Stand and Deliver! The episode of Australian Story featuring Brian and Bobbie Houston of the Hillsong Church being broadcast this evening got me thinking about Hillsong Music Australia, the Church’s musical arm. Hillsong Music has been releasing albums since 1988, fifteen of which have been recognised as attaining Gold status (that is, have sold over 35,000 copies) by the Australian Recording Industry Association (ARIA). The impressive thing about these sales figures is that they are not achieved the way virtually every other artist attains Gold or Platinum certification. The way it works in Australia is that labels report how much product they’ve shipped to shops, thus some artists attain Gold certification upon release. The chart placings themselves are derived by sales, as recorded by computers at selected ‘chart stores’ around Australia. The Hillsong Church, however, doesn’t distribute to stores; their big sales push comes at their annual conference, where they launch the CD recorded earlier in the year. As a result, the week following the conference usually sees that year’s Hillsong Church CD debut at its highest point in the charts; sales will continue thereafter, but they are not likely to be in the same massive quantities. Last year, Hillsong Church debuted at number one with the album For All You’ve Done. This year their album God He Reigns debuted at number two, held from the top spot by the Foo Fighters’ double album In Your Honour. While God He Reigns started to fall in the charts thereafter, the Foo Fighters stayed at number one for almost a month. They are currently at number four, while the Hillsong Church are at number thirty. 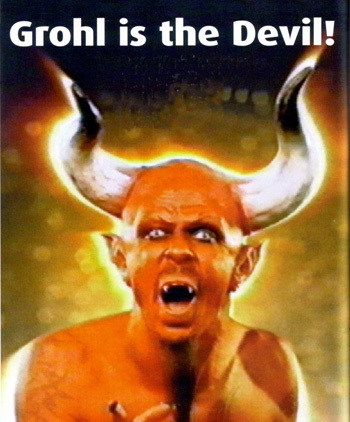 It tickles my funny bone to note that the Foo Fighters is Dave Grohl’s band, and Grohl appeared in the film clip of the Tenacious D song ‘Tribute’ playing the role of the Devil. But that wouldn’t have anything to do with anything… would it?